This entry was posted in By The Sea, Inspirations and tagged art, art process, beach photographs by Aria Nadii. Bookmark the permalink. I tend to just veg out on the beach. That looks like work. Those were my first three thoughts. Have you seen the film Rivers and Tides? Speaking of that director, have you seen “Touch the Sound” with the musician Evelyn Glennie? I haven’t seen it. I’ll look that one up. She’s a percussionist musician, and she’s “profoundly” deaf. It’s very cool! I definitely recommend it. It’s good to have your mind blown now and then. Nature and art. My favorite combo. WOW. Thanks for sharing this. I LOVE the spiral like crazy! I love spirals like crazy. C.P. and I are trying to build one in our garden out of flagstones and beach quartz. It is certainly not as easy to lay out a spiral as Jim Deneven makes it look. Wow. I’m going to echo this in my LJ. I think he should advertised everywhere possible. i’m spreading the word too. I think blogs are the best thing to happen to artists in a long time. Thanks for posting this…I have to show Gabriel this art. Gaby has a very limited view of the way art should look & be created, so I think this will help open his mind a bit. How curious. Does he criticize art that he thinks isn’t properly created? Any form of expression with his hands on paper (painting, drawing, even coloring) has always been a major trigger for episodes for him. I’m not sure if it is because of his fine motor skills issues (ie, had difficulties learning to tie his shoes until 7 1/2, issues with writing) or because of the delay between the signals from his eyes to his brain or just the fact that his imagination is incredibly vivid, so nothing he creates looks the way he sees it in his head. Gabriel feels art has to be perfect and true to life – a painted or drawn photograph, essentially. He doesn’t criticize other’s art because he isn’t cruel, but I haven’t yet asked him if he thought something was “art” to see how he feels about it. I only know that any time I explained to him about the different kinds of art, and how it is about expressing yourself & the emotion is what makes it art (and that it doesn’t have to be perfect) he blew me off and didn’t believe me. He has seen art on the computer (he likes Boticelli & similar artists’ work) & has a little book my friend gave him of paintings. He is finally at the point where I feel I can take him to an art museum, so we are going to do that during winter break. I love the beach and the water, combining that with art is amazing, you are right. How wonderful to spend the day creating such a piece of art. It would be fascinating to watch. These remind me of Tibetan sand paintings. I love it. I thought of Tibetan sand paintings. Oh thanks! I’ve had that first photo saved on my computer for a few years and never knew who created it. I am amazed at how perfectly laid out these are from above. I am amazed at how perfectly laid out these are from above. Small planes often take their flight patterns over the coastline. I wonder if some of those drawings mess with the perception of the pilots at all. The box and the cross specifically. From a certain angle, they create a rather surreal optical illusion. OMG… all those little circles! I saw the picture of him bending over, and my back started aching in sympathy, lol. He could always take a swim. I love art that fades back into the environment. “…leaving nothing.” Exactly as it should be. That new Klaus Schultz collaboration with Gerrard is amazing. Ideally, everything would leave nothing. Oops. I mean to post the link. 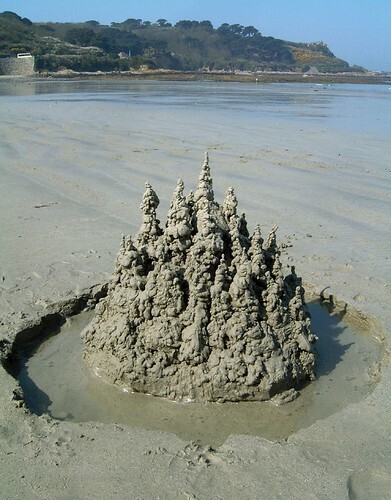 That is the strangest sand castle I’ve ever seen. The “egg pods” are also strange but interesting. No one builds castles or egg pods on our beach, just sand pits that I have to be careful not to fall into. I like the rake art.